I recently had the chance to chat with Todd Tresidder. If you don’t know the name, don’t worry. Up until about a year ago, I didn’t either. But, the short of it is that the guy is retired. In fact, he retired much earlier than most will. At the ripe “old” age of 35, he retired. Which must mean he’s off golfing around in the Arizona heat, right? Or down, sipping OJ at some southern Florida retirement village? Not likely. Todd is retired in the sense that he doesn’t report to a boss. He does what he wants, when he wants to. One of the things that he wants to do is write books that help people like you and I become better financially. He’s got several that he’s written so far, and I’m sure he’s working on more. During that first meeting, Todd and I spoke for a while on retirement. Speaking with another financially minded person, I usually expect to hear people talk about 401(k)s, IRAs, and stock purchasing. I don’t discount those tools, but I just don’t feel that, like Social Security, you should be depending on them for your whole retirement. Surprisingly, Todd agrees. The longer we spoke, the more we found that we agreed on. At the end of our conversations, Todd offered me a copy of his book on retirement. I accepted. Long story short, I finally read it. It took me a while, but I’m glad I got around to it. If there’s anything that stands out about the book, is that Todd knows what he’s talking about. He’s got the experience behind him to talk about the subject in an informed and educational manner, and technically, probably knows more about some of his subject matter than I ever will. He spends the first several chapters of the book dispelling a few myths about retirement, and about the way in which most people tend to think about it. He then takes off on a few chapters of some of the math and logic behind the different ways of calculating your retirement needs, and calculating that mythical “number” that everyone seems to be seeking out that will indicate that they’ve saved all that they need to save for retirement. Not only does that one perfect number not exist, he argues, but the calculations that we make to arrive at it are completely flawed. The rest of the book is focused on what I like to call the New Retirement. He goes into detail on the ways to properly estimate your income needs for the future, and then into ways that he believes (and I agree) that a properly diversified retirement “portfolio” should be structured. I don’t want to spoil too much of the book so I won’t say much more. What I will say is that the book isn’t terribly long. It’s not a deeply structured manual on all the different retirement accounts. And it’s not terribly expensive. It’s $4.99 on the Kindle (free for Prime members), and about $10 in paperback. Pick up a copy of How Much Money do I need to Retire at Amazon. 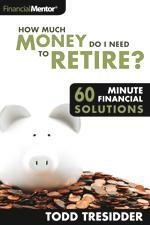 You can check out Todd’s site as well as the other books he’s written at FinancialMentor.com.